If you’re a frequent flyer with Southwest Airlines, here’s a proposition that loyal Southwest members can definitely enjoy. Introducing the Chase Southwest Rapid Rewards® Priority Credit Card that offers new cardmembers a chance to earn 40,000 points after you spend $1,000 on purchases in the first 3 months your account is open. With this card, you will not need to worry about any foreign transaction fees. You can also enjoy a $75 Southwest® travel credit each year, four upgraded boardings per year, 20% back on in-flight drinks, WiFi, messaging, and movies, 2X points per $1 spent on Southwest purchases and Rapid Rewards® hotel and car rental partner purchases, and more! • 7,500 bonus points after your Cardmember anniversary. • $75 Southwest® travel credit each year. • 4 Upgraded Boardings per year when available. • 20% back on in-flight drinks and WiFi. 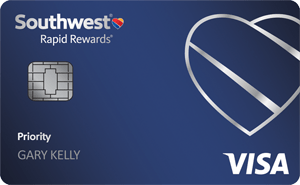 The Southwest Priority card earns 2 points per $1 spent on Southwest purchases. This also includes Rapid Rewards hotel and car rental partner purchases. Cardholders earn 1 point per $1 on everything else. Your points don’t expire as long as your account is open. Southwest award prices are based on the cash price of the ticket. There are no blackout dates as along as the ticket is available. However, award pricing isn’t defined. Southwest points are generally worth 1.5 cents each, but can go up to 1.75 cents each or higher. Southwest points can only be redeemed for Southwest flights. In addition to award flight redemptions, you can also donate your points to charities or gift your points to another Southwest frequent flyer program member. All points earned with either card count towards Companion Pass. This benefit lets a friend of yours fly with you free of airline charges for a year. Get an annual travel credit. Credit cards that offer annual travel credits often cover only incidental fees. The Southwest Priority card gives you $75 annual credit that you can use toward Southwest airfare and other things. 7,500 bonus points after your Cardmember anniversary. This is worth about $75. Earn tier qualifying points towards A-list Status. Get additional benefits, such as priority boarding and bonus points. In-flight benefits. If you frequently purchase Wi-Fi, drinks or other qualifying in-flight services, you’ll earn 20% back in the form of statement credit when you use the card to pay for these purchases. You’ll also receive statement credit when you purchase up to four upgraded boardings per year based on availability. This can go from a $30 to $50 value. “Our customers are always our top priority, and we’re making it even easier for them to travel and get rewarded,” stated Leslie Gillin (Chase Co-Brand Cards President). Customer appreciation day is every day. Southwest Airline’s customers mean everything to them. Southwest likes to think of themselves as a Customer Service company that happens to fly airplanes. From booking your trip to the moment you deplane, it’s their mission to make your travel experience a great one. From sea to shining sea (and the tropics). With an extensive network, Southwest serves more than 100 destinations throughout the United States, Mexico, and the Caribbean. Combined, they operate more than 3,800 flights a day including more than 500 roundtrip markets. Low fares. No hidden fees. That’s Transfarency. They do things differently at Southwest — so much so that they had to invent a word to describe it, Transfarency! It means that they’re all about being open and honest with their customers and making sure pesky fees stay away from their low fares. Bag fees? Not on their plane. When you fly with Southwest, your first and second checked bags fly free (yep, that includes skis and golf bags). No. Change. Fees. Yesss. In today’s fast-paced world, things can change in a moment’s notice. They continue to offer maximum flexibility if you need to modify your travel plans, by not charging change fees. If you need to change an upcoming flight itinerary, you’ll only pay the cost in fare difference and will never incur a separate change fee. Fees don’t fly with Southwest! With Rapid Rewards, your points will take you places. Prepare to earn reward flights faster and easier than ever before. With unlimited reward seats, no blackout dates, and points that don’t expire, you’ll be planning your next getaway in no time! The Chase Southwest Rapid Rewards® Priority Credit Card card comes with all of the terrific benefits as the award-winning Southwest Rapid Rewards® Premier Credit Card with an upgraded cardholder anniversary bonus and additional features! Now, this card is ideal for those who are frequently flying with Southwest, whether it be for personal or business. With that being said, there is an annual fee of $149, which is steep, but while considering the fantastic benefits such as the opportunity to earn an additional 7,500 bonus points per cardmember anniversary and a $75 Southwest travel credit every year alone (not considering the other outstanding benefits), the annual fee is subtle. Being Southwest loyal member, I can certainly agree that Southwest and Chase has done it again keeping their consumers in mind. If you don’t frequently fly Southwest or you’re interested in something else, see our list of credit card promotions today!